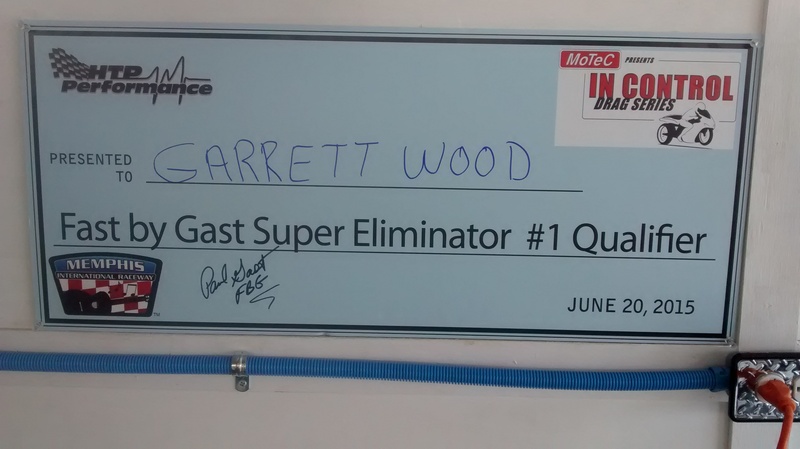 Garrett Wood realized a dream by setting a Super Eliminator record and qualifying No. 1 at the HTP Performance Nationals. The H2’s power and vigor made it a popular choice at the drag strip. The bike was campaigned in Pro Stock and other classes by famous legends like Dave Schutlz and Paul Gast. Paul Gast and Dave Schultz campaigning a Kawasaki H2 750 two-stroke in the very early days of Pro Stock. Super Eliminator racer Garrett Wood, Seattle, Wash., has a strong passion for the two-stroke twins and triples in the class. 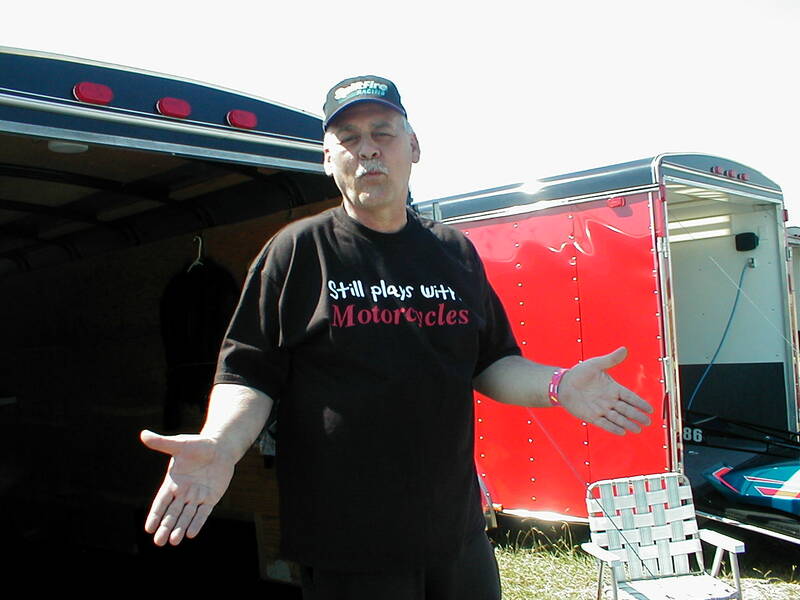 Wood, 60, grew up in Maitland, Fla. and began bracket racing at the age of 17 at Central Florida Dragway. “We just called it Bithlo. We rode our street bikes out and entered them.” said Wood. Garrett Wood sitting on one of his H2 750 Dragbikes. Wood became totally enamored with all different two-strokes, road racing Yamaha RD and RZ twins. 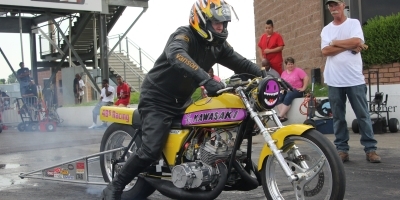 “Around 1999 I bought my first real dragbike while living in Fort Myers,” Wood commented. He had bought a FBG back-halfed triple. 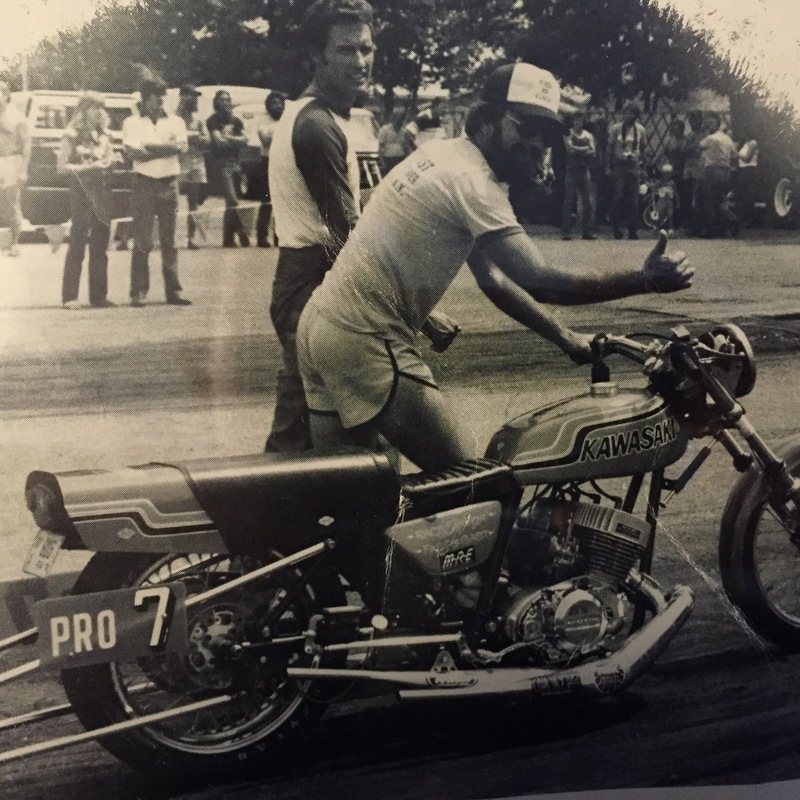 H2 racer and tuning ace, Bill Baxter, and a local Ft. Myers shop owner, Marion “GrandPa” Stewart, of Grandpa’s Cycle took Wood under their wings. Garrett Wood blasting off the line on a H2 750. 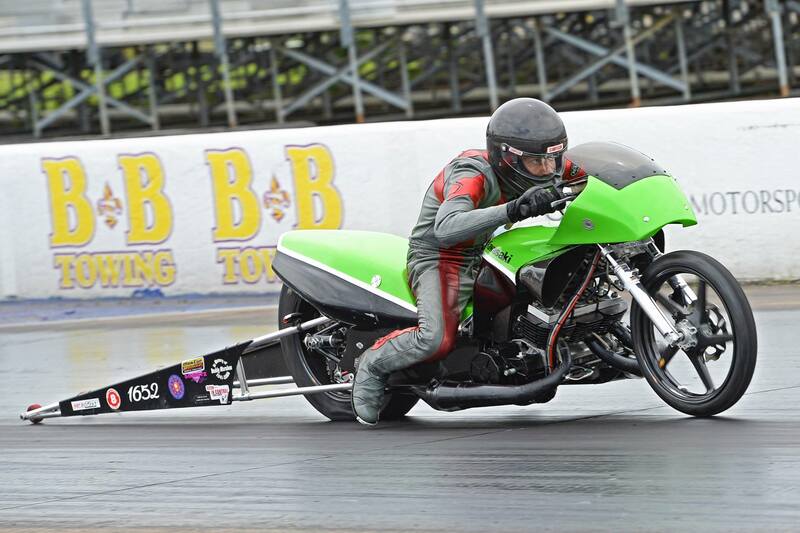 Seven weeks after wrapping up his professional career, Wood gave himself a retirement gift he will never forget by setting a Super Eliminator national record at the HTP Performance Nationals from Memphis International Raceway, June 20-21. 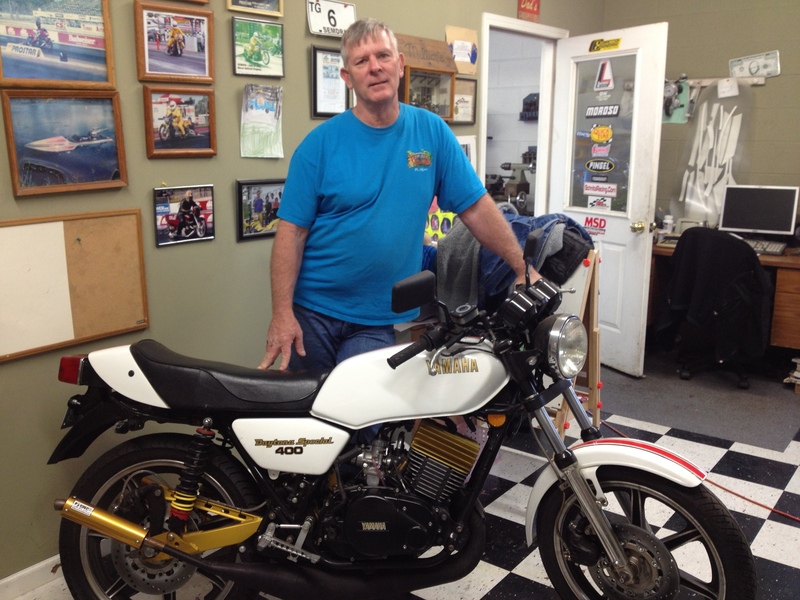 Super Eliminator enthusiast Butch Millon in front of a classic Yamaha RD400. Super Eliminator is a category open to all motorcycles. Competitors are put into a sub-class that matches their motorcycle’s configuration, determined by specifics like chassis type, engine displacement, fuel adders, and rider weight. The national record for each sub-class is used as an index. It is very similar to NHRA’s Competition Eliminator. 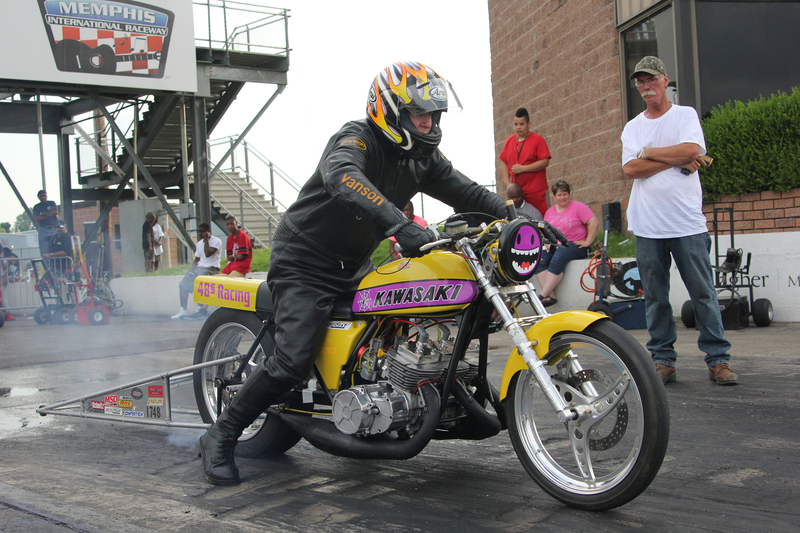 In recent years Super Eliminator has highlighted and showcased heavily-modified vintage two-strokes. “It’s a ton of fun,” Wood said. Wood, while in the area visiting family in Danville, Ky., agreed to compete in the Memphis race on a 1974 H2 owned, built, and tuned by Millon, of Knoxville, Tenn. 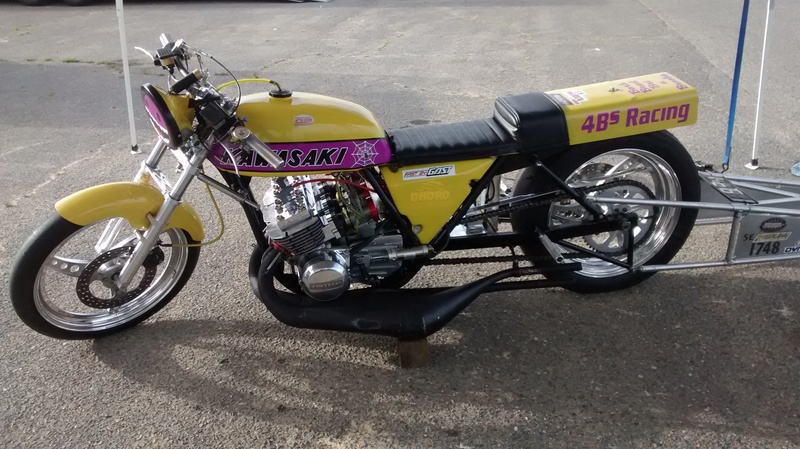 The bike was setup to be legal for several modified classes within Super Eliminator. Garrett Wood entered the race on a beautiful 1974 H2 owned and tuned by Butch Millon. Wood ran in the DD/M-HH class. A “HH” designation is added for riders who weigh in at more than 200 pounds. Wood’s best run came in the second round of qualifying with a 8.99 pass, and was then backed up with a 9.02, annihilating the previous DD/M-HH record of 9.59. A very humble racer, Wood refused to give himself the credit. The 8.99 also earned Wood the No. 1 qualifier position. That designation is awarded to the rider who runs the quickest against their individual class national record. Dave Schnitz, Bill Baxter, Garrett Wood and Butch Million in opening ceremonies. 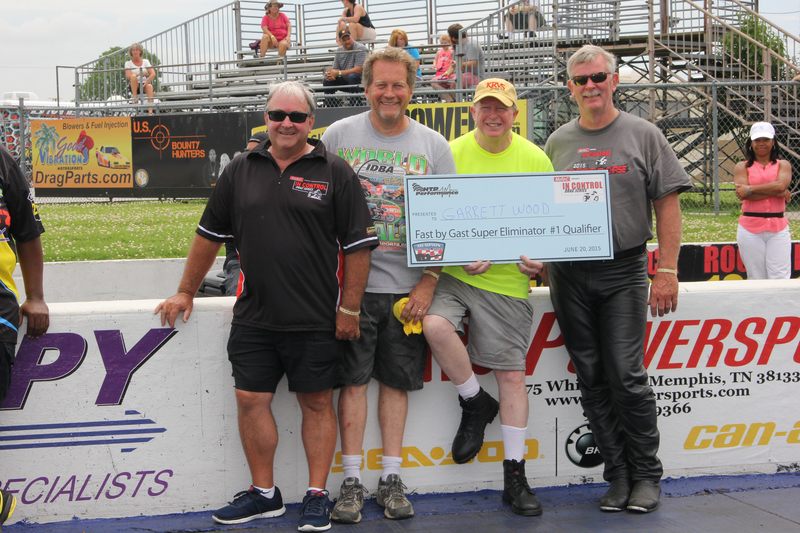 Even sweeter for the longtime drag racer, it was Wood’s first national event pole position. Wood is introduced during a pre-race ceremony with announcer Bill Hahn. On Sunday’s eliminations, Wood had a first round bye and ran 9.05 at 137 mph combined with a respectable .021 light. In round No. 2 Wood was upset with a razor-close margin of victory at .009. Wood dedicated his No. 1 qualifier and modified class record to John Jacob, a legendary two-stroke rider and tuner who passed away on March 5, 2013. 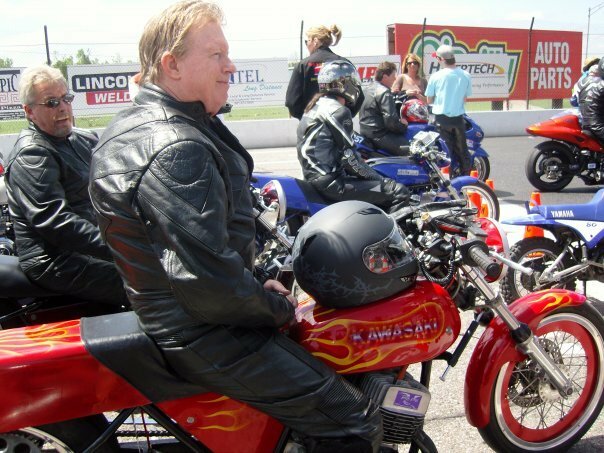 Enthusiast John Jacob proudly shows he “still plays with motorcycles.” Jacob was a legendary two-stroke rider and tuner who passed away on March 5, 2013. As ecstatic as he was with his own achievement, Wood was even more pleased to see his friends Alex Hughes and bike owner, Baxter record the quickest naturally aspirated H2 run ever at 8.21, beating the same motorcycle’s world mark of 8.24. Alex Hughes racing Bill Baxter’s motorcycle to the quickest naturally aspirated H2 750 pass ever at 8.21. Even more impressive is the fact that Hughes was off the throttle at 1,110 feet. Here is a flashback to 2007 when Baxter and Joe Bird used the same bike to break Dave Schultz’s over 20-year record. Even the great Gast, who was standing at the starting line, was floored and was heard saying it was the most impressive H2 pass he has ever seen. 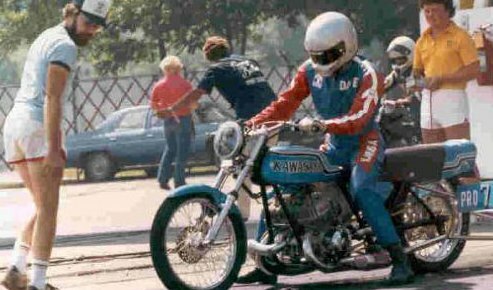 Paul Gast and Dave Schultz preparing their two-stroke for a run. 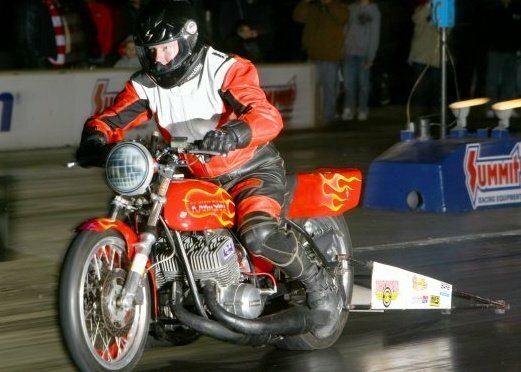 Alex’s father, Randy Hughes set a record of his own, recording the quickest H2 street bike pass at 9.77 on a motorcycle designed and built by the late Chris Ritchie of the U.K.
“There were nine records and indexes lowered at Memphis. There were many performance achievements from the guys”, said Wood, who recently retired as a district sales manager at GatesAir. The excitement continues to grow for the Super Eliminator class, now competing at select Manufacturers Cup races. The class has opened up to include two and four stroke machines, running in a format that more closely emulates the tradition established by the original IDBA category. Joe Mejia, Rick Steinard, Eric Barnett, Spencer Greer, Roy Johnson, Ronnie Johnson and Larry Zeintek also set new records on open indexes or lowered existing records. The next race in cool November air in Valdosta, Ga. should greatly alter the record book as well. Not to mention, it’s a lot of fun. Special thanks to Bland Bridenstine and Hot Rod Chrissy for photo contributions.